Older children enjoy party games as much as they enjoy ice cream and lollies! 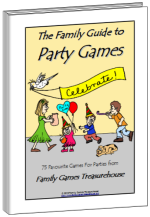 The childrens party games below will help make your next birthday party a real success. 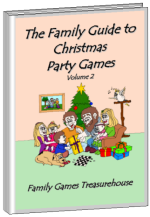 You may also like to check out Musical Party Games, Outdoor Party Games, Teenage Party Games and Preschool Party Games for some more childrens party game ideas. Initial I Spy is a good way for children to introduce themselves. Each child takes turns to stand up, say their name and then, in thirty seconds, name as many things as they can see with their initial. For example, Trevor may name a table, a telephone, a television and a tulip. Heights is another good childrens party game to play after Initial I Spy so the children can get to know each other better. All the children form a circle and hold hands. On the word "Go!" the children let go their hands and try to re-arrange the circle so that everyone is lined up in height order from tallest to shortest. Squeak Piggy Squeak is an alternative introductory game to play after Initial I Spy. One player is blindfolded, with all the other children seated quietly on chairs in a circle around them. The blindfolded child spins around three times and makes their way to the circle. They must sit on the lap of the first child they reach and say "Squeak, Piggy, Squeak". The child disguises their voice and squeaks like a pig. If the blindfolded child correctly guesses their identity they swap places, otherwise the blindfolded child is led back to the centre and tries again. 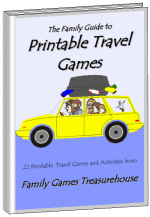 Jumbled Newspapers is an indoor childrens party game which requires one newspaper per child. Each folded newspaper has the pages out of order, upside down and back to front. On a given signal, the competitors must re-assemble their paper in the correct order. Paper Hats is a quieter game that can be played around a table. Each child is given a large sheet of coloured paper and some sticky tape to make their own hat within three minutes. An adult can judge the best hat as the winner. 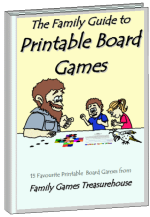 Posting Game is a team childrens party game, where each team must post ten letters in ten post boxes. The ten 'post boxes' (tins or cardboard boxes) are hidden around the room, each one with the name of a city written on the outside. An adult sits at a table with ten envelopes, addressed for the ten cities, for each team. The first player from each team must choose one letter, find the post box for that city and post it. They return to their team, tag the next player who then chooses another letter and posts it. (Players are not allowed to tell anyone the names of any hidden post boxes they find.) The first team to post all ten of their letters wins. Stepping Stones is a team relay game where players must use two large tins as stepping stones to cross from one end of the room to the other end. Players balance on one tin while they move the other tin forward and stand on it while moving the other tin and so on. When they get to the end of the room, the next player in their team must use the stepping stones to move back down the room, until all the players have completed the course. Take care that the floor is not too slippery or easily damaged. Kangaroo Racing is another team relay game. Each player must hop like a kangaroo from one end of the room to the other with a balloon between their knees, without dropping the balloon. If they drop it they must go back to their starting line. Balloon Bursting is another childrens party game involving relays. Each player must blow up a balloon and run to the other end of the room where they sit on the balloon and try to burst it. Duck Duck Goose is a fun, active childrens party game that can be played indoors or outdoors. Children sit in a circle, with one child standing on the outside of the circle. The child on the outside moves clockwise around the circle, touching the head of the seated children. As he touches them, he says, "Duck" for each child until he chooses to say to one child, "Goose". For example, he may say "Duck" to the first four players, but the fifth player is told "Goose". He may choose to go round the circle more than once before he says "Goose". Any child who is told "Duck" does nothing - they remain seated. However, the "Goose" must jump up and chase the first player clockwise around the outside of the circle. The first player tries to complete one lap and sit down where the Goose was sitting before the Goose tags him. If he is successful, the goose becomes the new player on the outside of the circle. If he is tagged, the Goose sits back down and the first player starts again. A supervising adult may like to ensure that every child is given a chance to be the Goose. Paper Island. A large sheet of newspaper is placed on the ground. Children must work together to have as many players as possible on the paper island without touching the shark infested water surrounding it. Cat and Mouse is a noisy but fun childrens party game where one player is chosen as the cat and another player is the mouse. All the other players form three or four lines of equal numbers, holding hands to form arches, with enough room between players for the cat and mouse to be able to move. The mouse runs along the lines and between the arches to avoid the cat. An adult can say "Change" at any time, and the players must turn sideways to make new arches between the lines, hopefully confusing the cat and making it harder to catch the mouse. If the cat catches the mouse (or after one minute, if the cat cannot catch the mouse) two new players become the cat and mouse. Floating Balloon. Each child is given an inflated balloon. They must try to keep the balloon in the air as long as possible (without touching it) by blowing the balloon from underneath. The last player whose balloon touches the ground wins. Children of all ages love the classic childrens party game - Pass the Parcel. Simply make up a parcel before the party with a bigger prize (for example, a bag of lollies) in the centre of the parcel and a small prize (for example, a small chocolate bar) placed between each layer of wrapping paper. You may like to ensure there is at least one prize per child, to make sure no one misses out. The game commences with the players sitting in a circle. When the music starts, players pass the parcel from player to player in a clockwise direction. The child holding the parcel when the music stops gets to open one layer and claim the prize. 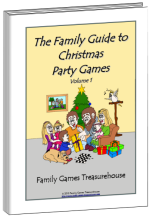 The music plays again and the game continues until one child claims the centre prize. (An adult may need to stop the music judiciously to ensure every child gets a prize.) The last child could be encouraged to share their big prize with everyone else. String Buns is a potentially messy childrens party game which may need to be played outside. A piece of string is tied between two trees about two metres (seven feet) high with one piece of string for each player (about one metre (3 feet) long) tied at intervals. Each of the shorter pieces of string has a bun or doughnut tied to one end, and hangs below the main piece of string. The first player to eat their bun without touching it with their hands or letting it fall to the ground wins. What party is complete without Pin the Tail on the Donkey? A donkey (without a tail) is drawn on a large sheet of cardboard and a tail is constructed from wool or similar material with a pin in one end. (If you prefer, you can print a donkey picture that you can cut out and paste onto cardboard by clicking here.) Children take turns to be blindfolded and attempt to pin the tail in the right place on the donkey without hints from other players (or parents!) The place where they pinned the tail is marked, with the closest to the correct position winning the game.